You don't have to look far on this site to realise that some of us here are big fans of Japanese writer, director and actor Shin'ya Tsukamoto, cult creator of the Tetsuo and Nightmare Detective films. Yesterday we were thrilled to learn that Third Window Films are to release Tetsuo: The Iron Man and Tetsuo II: Body Hammer on DVD and Blu-ray in October with remastered picture and sound. Today comes the news that Third Window are also to release Kotoko, Tsukamoto's latest feature and the first Japanese film ever to win the Best Film award in the Orrizonti of the Venice Film Festival, on DVD and Blu-ray the very same day. Young single mother Kotoko (played by folk-singer Cocco) lives alone with her baby son. Suffering from an unknown illness that makes her see double – especially people – and not knowing which version of the person is real, it severely impacts her day-to-day life, often leading to her to lash out violently. As her situation worsens and she becomes a liability, her son is taken from her a put in the care of her sister. Kotoko is left alone with her own thoughts – and for a person with an already broken mind that is a very scary place indeed. 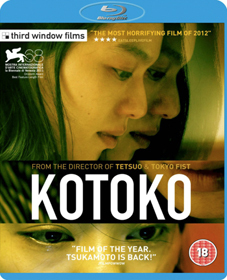 Kotoko will be released on UK DVD and Blu-ray on 8th October by Third Window Films. The RRP has yet to be confirmed.